2016.11.15 – Nala has found her home! 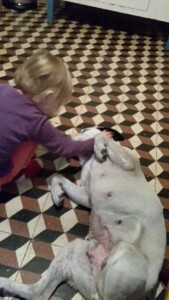 Nala, the bouncing dalmatian-mix female dog has found the family of her life quickly. We’ve been asked for help at the end of the summer, because she was lonely and then she was taken up by us. We’ve met a good-natured, nice and joyful dog and short after we’ve only just gone through her vaccination programme and neutering, after one and a half month of living in a pension, we’ve found her a temporary keeper and also a permanent owner inquired seriously and after they met each other, she moved in for probation. A few weeks passed by and we’ve been recieving positive news from her future owners, and we visited Nala at her family at the weekend and signed the adoption contract. 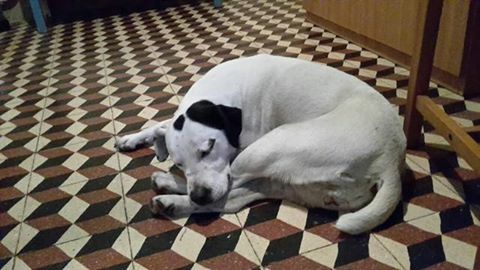 She’s found a lovely home, where she can rest indoors with the family, when it rains. There’s a big garden, too where she is free to play and they regularly take walks if the weather is nice. A trainer goes to them and Nala has learned a lot, because she’s treated with love. The most important rules are natural for her, for example, she never goes out if the gates are open, she waits for the owner’s permission. They told us in person about their common experiences, and we could see with our own eyes that Nala and the children really love each other. She’s always ready to cuddle, she’s always lying on her back waiting for a tummy-stroke. Thank you for helping in rescuing her and for your support!